T. Fisher Unwin, London. First Edition. Hardcover (Vellum). Good Condition/No Dust Jacket. Illustrator: Daniel Vierge. QUEVEDO-VILLEGAS, FRANCISCO DE. Pablo de Segovia, The Spanish Sharper, London: T. Fisher Unwin, 1892. Folio, first English edition (came 10 years after the first Paris edition), pp. 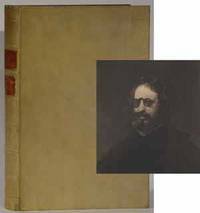 xlii, 239, vellum boards with red morocco labels on spine, gravure frontispiece showing the author, 110 drawings by Daniel Vierge, all edges tinted red, former owner's ID on free front endpaper. St. Onge, Worcester, Mass, 1961. First Edition. Hardcover (Full Leather). Fine Condition/No Dust Jacket. JOHN QUINCY ADAMS. 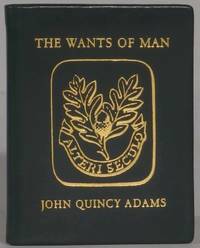 The Wants of Man, Worcester: Achille J. St. Onge, 1962. Miniature (about 2.25x3 inches or 6x7.5cm), edition limited to 950 copies, pp. 54, 1 (colophon), frontis portrait, dark green calf covers with gilt lettering and oak-leaf device to front, cover design by Rudolph Ruzicka. Bradbury, p. 253.